It's bare root tree time again! 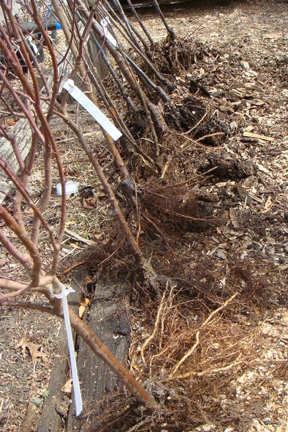 Bare root trees are a great way to buy and plant your trees. According to a study at Cornell University bare root trees have 200% more roots than their balled-and-burlapped cousins because of the way they are harvested. They are also lightweight and much easier to handle. And the best reason of all – bare root trees typically perform better. Because they don’t have dirt on their roots they settle into the soil with less transition problems. If you are thinking about adding a tree to your garden, take a look at our bare root tree selections for spring 2015. Read our blog on how to plant bare root trees. Call 630-355-4000 to reserve your tree before March 28. Once we're open stop by our Tree & Shrub department at either location to order while supplies last. A 50% deposit is required on bare root trees. Pre-orders will be taken until April 5, 2015.